As part of Embecosm’s community outreach we recently put on a soldering workshop at So Make It, the local Southampton Makerspace. This was to be part of their grand reopening after their recent move to a larger building. In our workshop we gave attendants the opportunity to build their own computer in the form of a Cuttlefish, a solder-it-yourself Arduino compatible circuit board. So Make It is a Makerspace in the centre of Southampton, conveniently located next to the mainline train station. It’s a not for profit, volunteer run endeavour, and has facilities to do everything from baking cakes to building sculptures. They’re also home to a bunch of enthusiastic and helpful members with a vast array of collective knowledge and skills. As well as our workshop, a number of other members put on workshops and demos in their own areas of expertise. These included a prop making workshop, experiments with conductive play-dough, knitting and cake decorating by So Bake Knit as well as DIY PCB experiments and using recycled wood to build a chair. From Embecosm, Jeremy, Simon and I attended, arriving early in order to set up and prepare a number of soldering stations. At the beginning of the day we had around 20 kits, tirelessly put together by Ben, one of my colleagues and an attendant of a local school here in Lymington. Throughout the event we were kept busy by participants of all ages eager to learn to solder, and by the end of the day around 10 kits had been completed, with a couple of extra used as salvage for replacement parts. Each time we put on a Shrimp or Cuttlefish workshop we learn something new. This time I think we were very successful in supervising the attendees as they were soldering; we had enough hands on deck to give the attention and help necessary to each person, and we could keep an eye out to make sure everyone was safe. We also had enough space, kits and tools for attendees to work comfortably despite it being incredibly crowded. There are still places I think we could improve. Something I hadn’t anticipated was the amount of time it would take to solder the kits together. 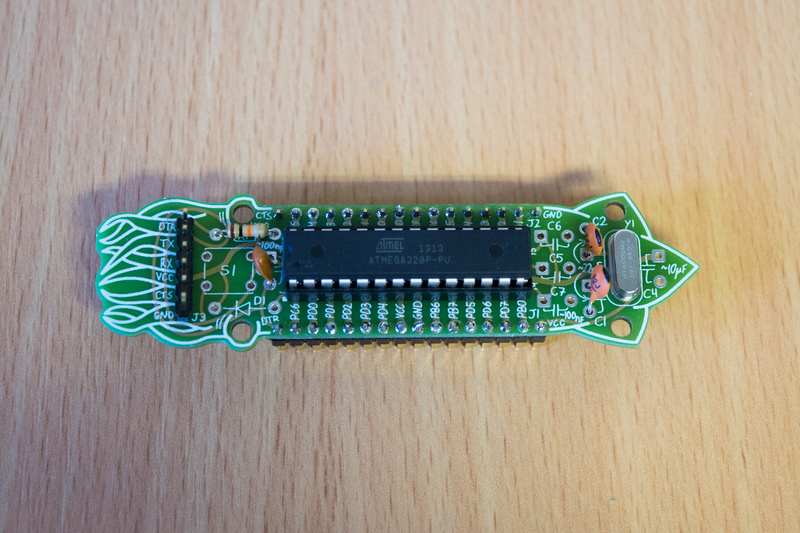 A combination of many-pin expansion headers and fiddly pin-bending meant soldering took a lot longer than expected, and I wonder whether it makes sense to reduce the number of components to make it less time-consuming. We could also do with a better demonstration for after the board is finished. On the day we used a simple test program, but I think we need something more grand and elaborate to show how people can hack their Cuttlefish once they’re finished. Despite these minor points the day was a resounding success, and we had plenty of entertainment to accompany the workshops. 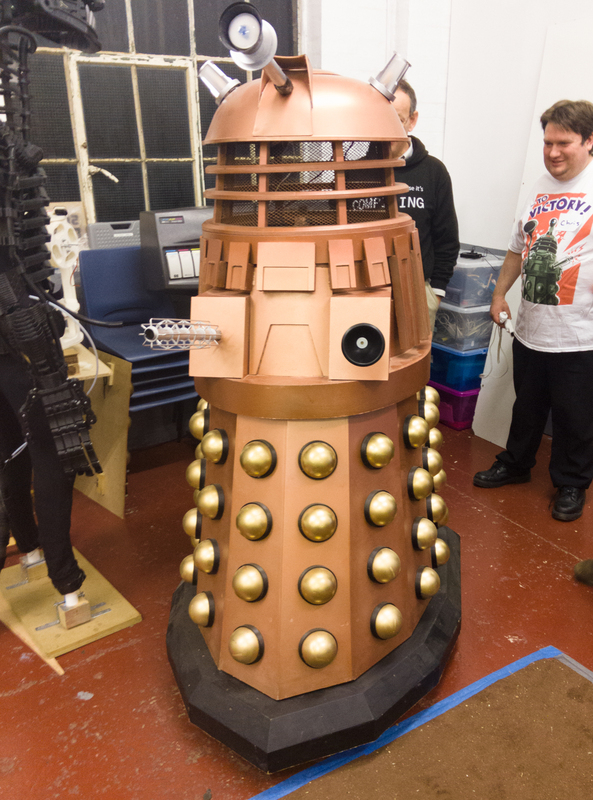 As well as the constant buzz from the 3D printers — including an incredibly neat 3-arm printer — there was Alan, the resident Dalek constructed by So Make It members, constantly roaming the floor. At the end of the day a couple of members brought out quadcopters for a demonstration, small and large with one constructed from a 3D printed frame. This had the relatively unsurprising effect of causing us to mysteriously spawn several quadcopters to ‘experiment’ with here at the office. I am very glad to have attended and taken part in such an awesome event!